Fifty-six years after the events of The Killer Shews (1959), Captain Sherman (James Best) returns to the island of the giant killer shrews, this time in service of a reality television show that wants to film there. The crew, complete with producers and a centerfold model, are there to shoot a ‘sizzle reel.’ Elsewhere on the island, a man (Bruce Davidson) commands an army of giant killer shrews and he’s seen an opportunity to feed his monsters. Captain Sherman again must face off against the shrews, only this time he might not get off the island alive. 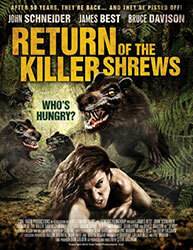 More of a silly homage than an actual sequel, Return of the Killer Shrews is mostly excuse to have a nice swan song for James Best as he reprises his role from the original film. Everything is largely played for jokes, which I understand, it is a movie about monstrous adorable rodents eating people, but I think it does do the film a bit of disservice. Part of the fun of the original was that fact that such a loopy premise was played with all the seriousness it could muster. The CGI shrews are much less convincing than the shag carpeted dogs of the original, and they take some of the fun out the mayhem. This was an obviously micro budgeted feature much more interested in an ad hoc Dukes of Hazzard reunion (Best is joined by John Schneider, along with Rick Hurst) than it is in being a monster movie. Still, the cast looks like they were having fun, I guess that’s something.